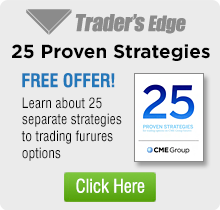 There are four primary strategies we implement involving the writing (selling) of options. All examples are excluding commissions and fees. Uncovered, or naked writing, involves selling a call OR put without entering into an underlying futures contract. A naked call writer has a neutral to bearish view of a market, while a naked put writer has a neutral to bullish view on a market. In most cases we recommend selling out-of-the-money options. This means selling a call with a strike price that is above the futures price or selling a put with a strike price below the futures price. In either case a dollar amount, or premium, is collected and credited to a client’s account. In the case of a short call this premium is retained if, by expiration, the futures has moved lower, stayed the same, or moved higher but not up to the strike price of the call. In the case of a short put the premium is retained if the futures has moved higher, stayed the same, or moved lower, but not down to the strike price of the put. 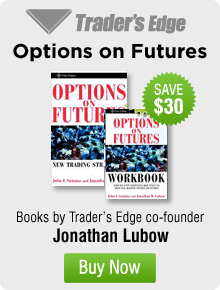 Example: If silver is currently $16.00 an ounce, you can sell a nine months to expiration $23.00 call option for $550. On expiration you will keep the $550 if the price is below $23.00. Even with a 31% increase to $23.00 at expiration the $23.00 call will be worthless. A short strangle is a strategy in which a trader simultaneously sells both an out-of-the-money put AND out-of-the-money call in the same market for the same contract month. This is the optimum strategy for trading sideways markets. All of the premium which was collected upon the initiation of a strangle will be kept if the underlying futures contract is between the strike prices on expiration. Example: If silver is currently $16.00 an ounce, sell a nine month $23.00 call option and a nine month $13.00 put option. Both options are out-of-the-money. By selling these two options you will collect a total of $1,300 in your account. You will keep the entire premium if at expiration silver is above $13.00 and below $23.00. A credit spread is a strategy that involves simultaneously selling an option and buying an option in the same month farther away from the market. The strategy is called a credit spread because the option that is sold has a greater value than the option that is purchased. Therefore, when a credit spread is initiated a net credit is received. Selling a credit spread is a limited risk trade. The maximum risk on a credit spread is defined by the value of the width of the spread minus the premium collected at inception. Example: The S&P500 is currently trading at 2711. An example of a credit spread would be to SELL a 129 day 2800 call and BUY a 129 day 2825 call. For the 2800 call, you collect 50 points. for the 2825 call, you pay 40 points. By selling this credit spread you collect a net of 10 points or $2,500. If the S&P500 expires below 2800 the maximum profit of $2,500 is retained. The maximum risk on this credit spread is 25 – 10 = 15 points or $3,750. This loss would be realized if the market is above 2825 on expiration. The same type of trade can be executed on the put side. Buy one closer to the money call (or put) and sell more than one deeper out of the money call (or put).